Image Caption: Israeli Prime Minister Yitzhak Rabin and Palestinian Liberation Organization Chairman Yasser Arafat shake hands at the signing of the 1993 Oslo Declaration of Principles. The Oslo Peace Process was the first direct, bi-lateral set of negotiations between the Israelis and Palestinians. Distinct from the multilateral Arab-Israeli track at the Madrid Conference, it represented a historic break-through between principal players. With the 1993 Declaration of Principles, the Palestinian Liberation Organization (PLO) officially recognized Israel’s right to exist. Meanwhile, Israel recognized the PLO’s right to self-government as an autonomous Palestinian people. While Oslo left many final-status issues such as the return of refugees, borders, settlements, and the status of Jerusalem undetermined, the exchange of land for peace, beginning with the 1994 withdrawal of troops from Gaza and Jericho, was promising. In theory, it would resolve the frustrating contest over territory ongoing since the expansion of Israel’s borders in the 1967 Six Day War, while committing both sides to resolve outstanding issues through non-violent means. Despite this early promise, historians recount the Oslo Accords with an overwhelming sense of failure and defeat. Ultimately, rejectionists from both sides managed to undo the delicate trade-off of land for peace. The peace process was hijacked and used as a springboard for terrorism and fear. Analysis of Oslo’s failure typically begins with an analysis of its limited capacity to endure throughout the 1990s. Indeed, Oslo stretched beyond the 1993 Declaration of Principles, to the 1995 agreement at Taba, or Oslo II, the 1998 Wye River Memorandum, and finally the 1999 Sharm El-Sheikh Memorandum. Oslo’s experimentation with the incremental building of trust, its gradualism, was fatal as it “provide[d] opportunities for destroying, as much as constructing confidence.” Leaders were forced back to Camp David in 2000 for an entirely new peace process as the momentum behind the interim agreement disintegrated. In fact, many argue that Oslo died as early as November, 1995, when Prime Minister and chief negotiator Yitzhak Rabin was assassinated by right-wing activist Yigal Amir in Tel-Aviv. This notion that individuals hold instrumental value in history has been essential to contemporary reflections on Oslo. For instance, historian Avi Shlaim insists it was not the fall of Rabin, but the subsequent rise of Likud Leader Benjamin Netanyahu, which is to blame for the failure of the accords. He notes that Netanyahu was a vocal opponent of the peace process as a young Member of the Knesset in the opposition and later as Prime Minister. From 1996 to 2000, the period for which Oslo II had promised significant withdrawal from the West Bank, Prime Minister Netanyahu oversaw the building of a record number of settlements. This paper rejects this individual-centered historiography. It must be noted that this approach was used by the signatories of the Oslo Accords themselves, who couched the process as a ‘‘peace of the brave.” Relying on the personal qualities of leaders, whether brave, or extremely fallible, to explain the strategic developments which occurred while they held office is a shallow approach which neglects the broader geo-political and national realities of the moment. In particular, the argument that an anemic leadership kept Oslo from surviving the turbulent resistance of the 1990s, ignores the compatibility of Oslo’s terms with the fractious reality of the Israeli-Palestinian conflict. It is this mismatch which arguably gave rise to resistance in the first place. Further, the neat paradigm of two coherent adversaries promulgated by the Oslo Accords, contradicted the internal battles gripping both the Israelis and Palestinians at the time. It was Oslo’s masking of the vital re-negotiations of sense and significance at the heart of Israeli and Palestinian society, which led to a debilitating distrust and stalling negotiations. It was not only the spoilers who explicitly intended to disrupt the peace process, but a poorly tailored peace process, which was to blame. This can be evidenced by the fact that genuine non-violent resistance to Oslo emanated from the moderate core of both Palestine and Israel. It was not exclusively the product of those at the fringes of radical society. Prospect theory in international relations, which seeks to explain deviations in rational decision-making, says that peace agreements must be “sold” by the elite to the general public. Oslo was “sold” as a peace between two peoples rather than a peace between delegations of statesmen, which is precisely why the failure to understand and incorporate the national aspirations of these peoples into the terms of the agreement, also led to its failure overall. Rather than fixating on the markers of its failure in the 1990s, this paper will explore the decision-making process which determined Oslo’s contents in the late 1980s. After this brief historical overview, it will proceed with a discussion of the internal disagreements facing both Israelis and Palestinians at the time. These clashes widened the gap between the official bi-lateral objectives of Oslo, and the vastly more complicated reality of each of the groups that was a party to it. First, the conflict over Israeli ideology and identity, and the emergence of the “new historians” and other Zionist revisionist who questioned the Israeli project in the rare reprise of peace which followed the tumult of the Lebanon War. Second, the contest over political representation in the Palestinian Territories. By recognizing the PLO as the sole legitimate political representative of the Palestinian people, Oslo manufactured an undemocratic consent about who ought to govern, and it enflamed existing tensions. The 1993 Oslo Declaration of Principles was inspired by an earlier peace plan by David Shultz of the Reagan administration, devised during the early days of the first intifada, the Palestinian uprising which began in 1987. The intifada led to renewed international attention and regional peace initiatives. Between February and June 1988, Shultz mimicked Henry Kissinger’s technique of “shuttle diplomacy” to promote his plan by travelling three times to the Middle East in five months. With the recent blunder of the U.S. Marines in Lebanon in mind, Shultz pursued a cautious U.S. Middle East policy which envisioned international diplomacy as a means to facilitate bi-lateral meetings to establish peaceful working relations and a government in the Palestinian territories. The goal was to keep the American mediators at a comfortable distance from the chaos of the Middle East. Ultimately, the plan was frustrated by the oncoming victory of George H. W Bush in the 1989 Presidential elections and the continued isolation of the PLO, which was in the early days of the intifada still reluctant to accept non- violent resistance. This changed in November 1988, when in a speech to the General Assembly, Yasser Arafat, the Chairman of the PLO, finally met U.S. demands to renounce terrorism, and accept United Nations Security Council Resolutions 242 and 338 which called for Arab-Israeli peace and mutual recognition. Arafat’s declaration re-invigorated hopes of a bi-lateral Shultz style plan, and it seemed truly genuine. Earlier in the year, Arafat had been denied entry to the United States to speak in New York. The Reagan administration proclaimed that Arafat “knows of, condones and lends support to acts of terrorism.” Shultz himself decided not to recommend a waiver of the law that prohibited individuals identified as terrorists from entering the country because ”no participant in a peace process can wave the flag of justice in one hand and brandish the weapons of terrorism in the other.” Of course this objection was referring to Arafat’s 1974 speech to the UN General Assembly, in which he came ”bearing an olive branch and a freedom fighter’s gun.” In this more intense speech, Arafat cautioned the audience, and the international community, not let the olive branch fall from his arms. He still presumably, held the fighter’s gun. It was unclear in 1974 where PLO violent resistance was headed and many were still reeling from the 1970 conflict in Jordan: Black September. In 1988, however Arafat made himself very clear. He sought a peaceful and just settlement, drawn from “realistic and attainable formulas that would settle the issue on the basis of possible rather than absolute justice.” In essence, Arafat was turning the page on revolutionary pipe dreams of reclaiming the whole of Eretz Israel, from the Mediterranean sea to the Jordan River. Additionally, the 1988 speech was accompanied by a new Palestinian Declaration of Independence written by renowned Palestinian poet Mahmoud Dariwsh and proclaimed by Yasser Arafat on 15 November 1988. Throughout 1989–1990, U.S. peacemaking efforts centered on a plan similar to the Shultz plan, put forward by Israeli Prime Minister Yitzhak Shamir. It called on the Palestinians of the West Bank and Gaza Strip to elect representatives who would negotiate interim arrangements for self-governance with Israel. This would be followed by a permanent status agreement. However, In March 1990, controversy over how to proceed with Shamir’s plan led to the fall of Israel’s national unity government. The failure of the plan, combined with sharp U.S.-Israeli exchanges over Israeli settlement-building in the Occupied Territories, strained relations between Bush and Shamir. Yet again, the ambitious land-for-peace style deal was put on hold in favor of a traditional multi-lateral track. The United States proceeded with the October 30, 1991 Madrid Peace Conference. Co-chaired by President George Bush and Soviet President Mikhail Gorbachev, the conference was attended by Israeli, Egyptian, Syrian, and Lebanese delegations. It was the first time all parties to the Arab-Israeli conflict gathered to hold direct negotiations. Importantly, the Palestinian team was part of a joint Jordanian delegation which expressly excluded the PLO. Exiled in Tunis since their expulsion from Southern Lebanon in 1982, the PLO was not considered the prevailing voice of the Palestinians. Furthermore, Madrid was curated by America’s NATO Gulf War coalition which had just succeeded in driving Saddam Hussein’s forces from Kuwait. The PLO was a vocal supporter of Hussein and the Ba’ath Party in Iraq, and was therefore unwelcome. The problem with Madrid was that the bicycle peddle was stuck. Israel and the U.S. focused on the Syria track to resolve missile threats in the Golan Heights but Hafez Al-Assad of the Syrian Ba’ath party was an incredibly difficult negotiator. Al-Assad was unwilling to make compromises. As the squabbles of the Arab world slowed Madrid down to a halt, Yossi Bellin and Shimon Peres began to think of an alternative strategy, back to the original essence of the Shamir and the Shultz plans. Oslo’s primary significance was the promotion of a formula of land for peace and the mutual recognition of both sides. Land for peace is a legal interpretation of UN Resolution 242. It affirms that peace should include the application of two principles: withdrawal of Israeli forces (giving up land) and termination of all claims or states of belligerency (making peace). In addition, Oslo essentially provided the constitution for a de facto government in the Palestinian territories. The Palestinian Authority would be self-governing in terms of raising taxes and spending revenues on portfolios like health, police, and social welfare. Palestinian jurisdiction for the interim agreement was split into Area A, where it maintained full control; Area B where Palestinian civilian control was combined with Israeli security control; and finally Area C with full Israeli security and civil control. After a five-year interim period, the hope was that negotiators would move on to a permanent settlement which addressed the tricky details including Areas B and C.
This proved very difficult. While there was one high-level committee for figures like Abbas and Peres, a “nuts and bolts” committee met at the Red Sea resort of Taba regularly. Negotiations on the transfer of security authority to a growing Palestinian police force were particularly challenging. Underlying the “labyrinth,” negotiations at Taba in 1995 was a basic conceptual divide. The Israeli representatives wanted a gradual and strictly limited transfer of power to Palestinian police to maintain overall responsibility for security, while Palestinians wanted an early and complete transfer of power to enable them to lay the foundations for an independent state. Furthermore, seeds of mistrust on security matters were sown by disruptive resistance and violence from both sides. Hamas set out to embarrass Arafat and delegitimize non-violent resistance. The day before the Declaration of Principles was signed, Hamas killed three Israeli soldiers in Gaza. The day afterwards, a suicide bomber self-exploded in a police station. Between 1993 and 1996 a total of 300 Israelis were killed in such attacks. The Israeli consciousness was particularly wounded by the 1994 Dizengoff bus attack which killed 13. Many pondered the fact that the No.5 bus targeted by Hamas, ran to a prosperous area of north Tel Aviv which was home to many supporters of the Labor Government. Palestinian terrorism was becoming more severe, uncontainable and chaotic. This escalation made the essential cause of violence, calls to justice against the occupation, more difficult to sympathize with, even for left-wing Israelis. Likewise, the 1994 Hebron massacre killing 29 Palestinian worshippers in the Mosque of Ibrahim during the holy month of Ramadan by Baruch Goldstein, an Israeli settler and member of the far-right Kach movement, hardened the Palestinians. UN Resolution 904 condemned the incident and expressed shock and grave concern about how a lack of security control for the Palestinian people would influence the peace process. The Israeli Knesset consequently banned the Kach party from politics. The Hebron attack, similarly to the Dizengoff attack, irreparably damaged trust. Dizengoff confirmed Israelis’ fears about negotiating with “terrorists.” Even though PLO and Hamas commands were separate, Israeli media painted all “Palestinians” as one. Meanwhile, the Hebron attack by a settler on a Mosque, spoke to the broader challenges posed by increasing numbers of settlements to the survival of the Oslo accords. By-pass roads violently cut through land; and walls erected to separate communities claimed additional land. As the Oslo interim agreement inched closer to a final-status negotiation, the violence and tension between the Israelis and Palestinians only increased. For example, Oslo II, which was signed on the 28th of September, 1995 was substantively insignificant. Oslo II extended on the principle of Palestinian authority explained in Oslo I by providing elections to a Palestinian council, permitting the transfer of legislative authority to this council, and providing for the withdrawal of Israeli forces from more Palestinian urban centers. However, Oslo II was incredibly significant in the reaction it incited. The day the Knesset endorsed the agreement, demonstrators gathered in Zion square in Jerusalem. Netanyahu, the leader of the Likud, “was on the grandstand while demonstrators displayed an effigy of Rabin in an SS uniform.” A month later, Rabin was assassinated by Yigal Amir, a religious-nationalist. After the death of Yitzhak Rabin, settlement activity continued under several prime ministers, Labor as well as Likud. Importantly, Oslo II was endorsed by the Knesset by a majority of just one vote. Oslo was not only doomed by a growing distrust between Israelis and Palestinians, but rather by its neglect of the divisions in internal politics, and the slim margins of consensus on both sides. Shimon Peres followed Rabin down the “pot-holed road to peace” but his efforts ended with his electoral defeat in May 1996. Rabin’s successor, Ehud Barak, struggled with providing staunch leadership on the peace process and let his hand slide on settlements. The same was true of Ariel Sharon who succeeded him. Ironically, when Netanyahu came to power, intense American pressure actually compelled him to concede territory to the PA on two occasions, the Hebron Protocol of January 15 th,1997, and the Wye River Plantation Memorandum of October 23rd, 1998. The Likud government committed to withdrawing from a further 13% of the West Bank in three stages over a period of three months. However, a revolt in Netanyahu’s own ultra-nationalist and religious coalition brought down the government after just one settlement withdrawal. The fall of the coalition government was in some way inevitable because of the basic contradiction between its declared policy of striving for peace with the Arab world and its ideological makeup, which militated against trading land for peace in favor of a purely Jewish state. Meanwhile, on the other side of the green line, the bloody tug of war for legitimate rule over the Palestinian people continued to be fought between Hamas and the PLO. The end of the Cold War and the Gulf War represented seismic shocks to the international system which at the time seemed to reduce the risks of seeking peace and increasing the incentives to take such risks for both the Israelis and Palestinians. Indeed, the geopolitical arena had changed, shaping a “new world order,” more impartial to the conflict and willing to provide the time and resources to broker a peace. Moscow’s embrace of “new thinking” in foreign policy, and coalition making based on a united front for justice rather than bi-polar Cold War competition, gave negotiators the hope that this Middle East peace — free of Soviet arms deals, proxy wars, or covert support to terrorist organizations like the PFLP — would be different. The purpose of the bi-lateral meetings in Norway was in a way to drown out the noise of the international community, now supposedly at peace with itself, to leave the Israelis and Palestinians to their own devices. While recent developments may have been conducive to global peace, this model neglected the internal divisions which had been sown in Israeli and Palestinian society. These will be explored in the coming two sections. They were the greatest barriers to building trust, and finding peace. Yaron Ezrahi writes in his book Rubber Bullets, on power and conscience in modern Israel, about the understudied effect of the intifada on Israeli society. The intifada ushered a transformation in the way Israelis envisioned their relationship with the Palestinians. It led many to acknowledge the quest for Palestinian national self-determination for the first time ever and changed Israel from a warrior to a peace-making nation. To Ezrahi, nothing symbolized this cultural shift better than the army’s use of rubber bullets to confront stone-throwing Palestinians during the second intifada. He credits democratic liberalism, which flourished as Israel inched further away from the intense military years of the Arab-Israeli wars of the 1960s and 1970s. Why was Israel unable to sustain a peace-making policy orientation after Rabin’s death and throughout the Oslo peace process? One simple explanation is the disruptive terrorist attacks discussed above. The attacks hardened both sides and sowed distrust. However, if Ezrahi’s thesis about liberal democracy is true, the return to warrior Israel is also about the defeat of an individualist and free-thinking identity in favor of a collectivist nationalist one. The Oslo peace process did not provide an ideology or symbol of nationhood to match its policy of peace with the Palestinians. In the absence of a common narrative, “Jewish Israel” and “democratic Israel” re-engaged in an identity battle, each in an effort to cast their narrative as the mainstream. This identity struggle was exacerbated by the emergence of the “new historians,” who presented radically new national facts and modes of historical interpretation. Coined by author Benny Morris, “new historians,” describes a group of young Israeli writers recasting the standard Zionist narrative. Morris, along with Shlaim and several others, told a history of Israel’s triumphs that for the first time, did not hide a Palestinian history living by its side. In doing so, they challenged the foundational beliefs that Israelis held as self-evident. For decades, Israelis both politically left and right were raised on a celebratory version of their history – a story of the heroic return to Zion and the resettlement of the desolate Jewish homeland. Morris and his colleagues shifted the focus of historical inquiry away from the wonder of Jewish national rebirth to that of Palestinian suffering. This historical interjection essentially raised the stakes over narrative control, and furthered societal divisions. Israelis squabbled over the legitimacy of activist organizations like “Peace Now,” and the appropriateness of history school books and the national curriculum. The long-term structural forces of demography in the country, namely the disproportionately high growth rate of the ultraorthodox and Religious-Zionist segments of the population and their membership in majority coalitions in government, probably led to the victory of collectivist, warrior Israel over time. More importantly for this discussion, however, Israelis emerged as a disorganized unit with no common conception of their national aspirations. This hurt Oslo’s chances. The identity crisis proved debilitating. It is important not to present this renegotiation of Israeli identity as purely factional, and especially not to present it as a conflict between secular and religious Israelis. Monumental questions about Israel, its place relative to Palestine, and its position in the Middle East, were prevalent amongst individual Israelis and engaged with in different ways. This is why the narrative of extremists dismantling peace is too simple. 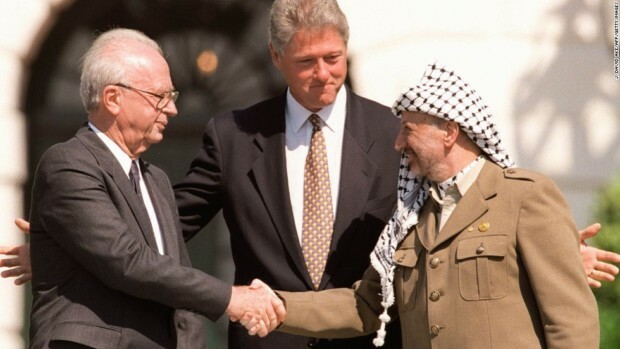 Final-status negotiations were consistently delayed in the context of the Oslo Accords, because they would force such moderates to engage with their contradictions. Importantly, it would also warrant that political leaders take a decisive position in the fight between the liberal and conservative conceptions of Israel. The argument which insists that the failure of Oslo was as a result of the failure of leadership in the face of resistance, disregards what was a complex reality for leaders who had to balance their personal political ideology, that of their party, and their prospects of political success. To win elections, politicians must align their platforms with popular sentiments. Final-status negotiations which would deal with the return of refugees, or indeed the simple recognition of the total number Palestinians living in Israel as citizens, posed a major dilemma to both the identity calculus and the political calculus. How could Israel remain both a Jewish and democratic state if the majority was Arab? This was perhaps the most important final-status question. As the internal struggle over identity persisted, Israelis and their leaders never emerged united to answer such difficult final-status questions. The intifada was a mass uprising of Palestinians through mostly nonviolent means like boycotts and demonstrations. The PLO’s willingness to engage in the Oslo peace process with the intifada raging in the background fueled disenchantment and the view that Arafat and his henchmen were collaborators of Israel. Many Palestinians did not consider the international arena, no matter the promises of post-Cold War peace, an even playing field in which to seek a just end to the occupation. Where identity and ideology were contested on the Israeli side, the Palestinians were uneasy with the legitimacy Oslo gave to the PLO as their rightful leaders. Furthermore, the loss of life and the despair that ensued after the popular resistance movement fell apart, led many to the Islamic militant group, Hamas, which grew rapidly in its pledge to Palestinian liberation through “sacrifice, blood and jihad.” Hamas of course became a significant spoiler of the frail pacifism which held Oslo together. Again, a recasting of “extremism” is required in this discussion in order to arrive at a better understanding of the essential internal divisions gripping the Palestinians. Criticisms of the accords were not exclusive to the periphery of Palestinian society, and indeed came from its very center, notably, from poet Mahmoud Darwish, who had written the 1988 PLO Charter which accompanied Arafat’s renunciation of violence at the United Nations, and academic Edward Said. In the London Review of Books the morning after the signing of the Declaration of Principles, Said wrote about his many apprehensions with the deal. He saw in the PLO another corrupt Arab government, with injustices emanating from the considerable divide between the elite and the people, where Palestinians themselves were but “guests,” and never key partners in governance. He considered the gains of the intifada squandered by the PLO’s unwillingness to seek multiple alternatives in negotiations. This demonstrated that prospect theory – the “selling” of peace accords from the elite negotiators to the people – clearly failed. Edward Said provides an important reflection on violent terrorism, arguing that the terms of the accord and the framing of the process by the PLO drove people to violent extremism by renouncing their right to popular resistance. Though Hamas and Professor Edward Said stood at wildly different junctures in the world, it was the same point about the strait jacket of international diplomacy and the assignment of the PLO as the ultimate leaders by foreigners without the consent of the people, which both Hamas and Said questioned. By no means was Said the singular voice of moderate resistance, nor should his particular criticisms be taken as the ultimate reasons for why the Oslo Accords failed. Nonetheless, his challenge to the idea of the PLO’s unquestioned predominance speak to the problem with Oslo’s negligence of Palestine’s long history of contested leadership, and indeed it’s constant negotiation between violent and non-violent resistance. Like its negligence of the Israeli contest over identity, this proved fatal. The original Arab Nationalist Movement of George Habbash, was an umbrella organization which branched off into several other Palestinian groups like the PLO and the Popular Front for the Liberation of Palestine (PFLP) during the 1970s. Intense rivalries divided these factions as they sought influence. The PLO including Arafat was expelled from Beirut to Tunis by the South Lebanon Army and the Christian Phalange following the 1982 invasion of Lebanon by Israel, not to mention its earlier expulsion from Jordan following Black September in 1978. Distant from the active arena of warfare, and eager to gain a push towards legitimacy by the international community, the PLO developed an argument for non-violent resistance. Meanwhile, the PFLP which represented a secular socialist resistance, stood by its legacy of airplane hijackings and car bombs. The first Intifada took a “new mythological character embodied in the ‘stone child’ or stone-throwing youth, which assumed the role of the fedayee who had been worn out by his conflict abroad.” This was of great help to the PLO, as the international and domestic trends favored the strategy of non-violence it had adopted by necessity. While this convenient alignment of values empowered the PLO at the moment, doubts about their commitment to full and meaningful justice for all Palestinians, including those displaced, led many to doubt the PLO’s intentions and the power given to them through Oslo’s interim governing arrangement. As Said and Darwish warned, this temporary structure imparted a long-term reality. The lethargy of the PLO and its elite organization, combined with a fervor for resistance that was ignored, led to a splintering of leadership between violent and non-violent. Palestine became “fragmented between two internal entities, having transformed the confrontation with the enemy into a confrontation within [itself].” As the spoilers of peace continued on the other side of the green line, and anger from Palestinians in the ever shrinking green line grew, the Palestinian leadership, like the Israeli, never meaningfully moved forward towards final-status negotiations. The understanding of states as cohesive units in international affairs with secure leaders at their helm cannot be assumed in a situation where the Israelis are constantly re-negotiating their identity and the Palestinians do not know who is in charge. The two-state solution did not necessarily die because Netanyahu and successive Israeli governments were determined to kill it, and it was not because Palestinians allowed terrorism to take place. The moral courage of individuals is not what should be in question, but rather the compatibility of an agreement with the aspirations of the people. In such a theater of pain and distrust, both the policy solution, and the mode of its communication to the public are equally important. With no grasp of the internal battles which were re-negotiating national aspirations, Oslo missed the mark. Whether willful, or completely unintentional, “ignorance of narratives on both sides lead to a situation in which both sides including their respective leaders were unaware of the red lines and domestic constraints limiting the other.” This discussion cannot be treated as a cultural after thought. Rather than theorize about what Oslo’s failure means, understanding the meaningful internal barriers to trust which leads to its downfall is critical if there is ever to be a revival of the peace process which fully acknowledges Palestinians and Israelis with full respect. Joudy Sarraj is in her final year at the University of Toronto as a Heaslip Scholar. She is a double major in international relations and ethics, society and law. Joudy is interested in institutional and economic development issues, particularly in post-conflict scenarios. Landon. E Hancock and Joshua. N. Weiss, “Prospect Theory and the Failure to Sell the Oslo Accords,” Peace & Change 36 (2011): 429. Lawrence Freedman, A Choice of Enemies: America Confronts the Middle East (New York: Public Affairs, 2008), 317. Avi Shlaim, The Iron Wall: Israel and the Arab World (London: Penguin, 2000), 603. Landon. E Hancock and Joshua. N. Weiss, “Prospect Theory and the Failure to Sell the Oslo Accords,” Peace & Change 36 (2011): 433. William B. Quandt, Peace Process: American Diplomacy and the Arab-Israeli Conflict Since 1967 (Washington, D.C.: Brookings Institution Press, 2005), 393. Lawrence Freedman, A Choice of Enemies: America Confronts the Middle East (New York: Public Affairs, 2008), 326. “2282nd Plenary Meeting.” United Nations General Assembly. November 13, 1974. “Speech by Yasser Arafat to the United Nations,” Haaretz, May 13, 2002, https://www.haaretz.com/1.5268352. “Palestinian Declaration of Independence,” MidEast Web, November 15, 1988, http://www.mideastweb.org/plc1988.htm. Avi Shlaim, “The Rise and Fall of the Oslo Peace Process,” International Relations of the Middle East, eds. Louise Fawcett (Oxford: Oxford University Press, 2013), 50. “The Madrid Conference, 1991,” Office of the Historian, https://history.state.gov/milestones/1989-1992/madrid-conference. William B. Quandt, Peace Process: American Diplomacy and the Arab-Israeli Conflict Since 1967 (Washington, D.C.: Brookings Institution Press, 2005), 390. “The Madrid Conference, 1991,” Office of the Historian, https://history.state.gov/milestones/1989-1992/madrid- conference. Avi Shlaim, “The Rise and Fall of the Oslo Peace Process,” International Relations of the Middle East, eds. Louise Fawcett (Oxford: Oxford University Press, 2013), 55. Lawrence Freedman, A Choice of Enemies: America Confronts the Middle East (New York: Public Affairs, 2008), 314. Benny Morris, Righteous Victims: A History of the Zionist-Arab Conflict, 1881-1999 (New York: Knopf, 1999), 612. Avi Shlaim, “The Rise and Fall of the Oslo Peace Process,” International Relations of the Middle East, eds. Louise Fawcett (Oxford: Oxford University Press, 2013), 60. Dennis Ross, Margaret Warner, and Jim Hoagland, “From Oslo to Camp David to Taba: Setting the Record Straight,” The Washington Institute, Policy Watch 340,August 14, 2001, http://www.washingtoninstitute.org/policy- analysis/view/from-oslo-to-camp-david-to-taba-setting-the-record-straight. Avi Shlaim, “The Rise and Fall of the Oslo Peace Process,” International Relations of the Middle East, eds. Louise Fawcett (Oxford: Oxford University Press, 2013), 72. Lawrence Freedman, A Choice of Enemies: America Confronts the Middle East (New York: Public Affairs, 2008), 320. Avi Shlaim, “The Rise and Fall of the Oslo Peace Process,” International Relations of the Middle East, eds. Louise Fawcett (Oxford: Oxford University Press, 2013), 48.
International Relations 5 (1999): 5-36. Yaron Ezrahi, Rubber Bullets: Power and Conscience in Modern Israel (New York: Straus & Giroux, 1997), 151. Landon. E Hancock and Joshua. N. Weiss, “Prospect Theory and the Failure to Sell the Oslo Accords,” Peace & Change 36 (2011): 427- 452. Representation of the Palestinian Refugee Problem,” Perspectives on Politics 5, no. 2 (2007): 241-58. Paul Scham, “The Historical Narratives of Israelis and Palestinians and the Peacemaking Process,” Israeli Studies Forum 21, no.2 (2006): 64. Studies Forum 23, no.2 (2008): 55-72. Lawrence Freedman, A Choice of Enemies: America Confronts the Middle East (New York: Public Affairs, 2008), 411. Amos Oz, The Slopes of Lebanon (Tel Aviv: Am Oved Publishers, Ltd., 1987), 40. Studies Forum 23, no.2 (2008): 55- 72. Paul Scham, “The Historical Narratives of Israelis and Palestinians and the Peacemaking Process,” Israeli Studies Forum 21, no.2 (2006): 59. Lawrence Freedman, A Choice of Enemies: America Confronts the Middle East (New York: Public Affairs, 2008), 322. “Leaflet No. 1,” Jewish Virtual Library, 1988, https://www.jewishvirtuallibrary.org/jsource/Terrorism/hamasintifada.pdf. Edward Said, “The Morning After,” The London Review of Books 15, no. 20 (1993). Avi Shlaim, The Iron Wall: Israel and the Arab World (London: Penguin, 2000). Leila Khaled, My People Shall Live: The Auto-biography of a Revolutionary, eds. George Hajjar (London: Hodder and Stoughton, 1973). and Hannah Arendt,” College Literature 38, no.1 (2011): 88. Paul Scham, “The Historical Narratives of Israelis and Palestinians and the Peacemaking Process,” Israeli Studies Forum 21, no.2 (2006): 56.